It’s been quite a while since I’ve been able to have a nice, sit-down restaurant in Grand Rapids on my dinner break. One day last week, I finally got that. A colleague and I were on the west side of town and had some time to spare. We were both hungry and I suggested that little Irish pub we drove past earlier. 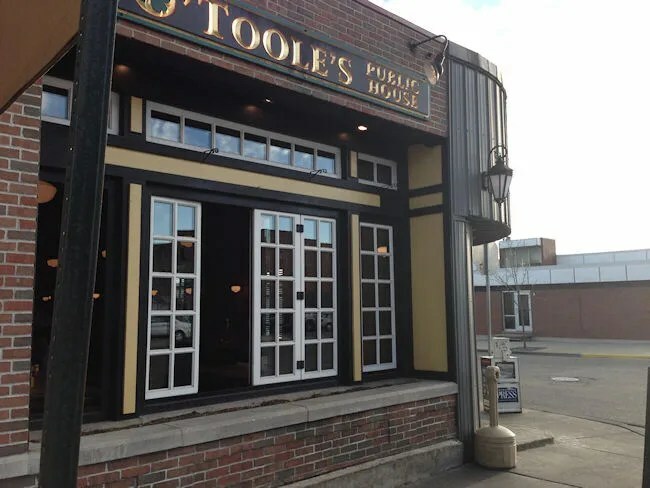 O’Toole’s Public House sits right in the epicenter of a redeveloping West Side neighborhood on Bridge Street just to the west of US 131 and downtown Grand Rapids. The small Irish pub sits on the corner of Bridge Street and Winter Avenue. At first glance, the pub looks a little out of place, but they’re actually just ahead of the curve. Parking can always be a little tricky in this area. We got lucky and found street parking just a few storefronts down which is surprising because the bar was pretty packed. We just missed happy hour and there were obvious groups of co-workers from the hospitals just down the street. C.W. noticed a table up against the wall that was empty near the front entrance, so we grabbed that then tracked down a waitress for a couple of menus. We had time to eat dinner, but there was still a little bit of a rush to it. I actually felt a little at home inside the pub. It had a very lively atmosphere with baskets of peanuts on the table and empty shells on the floor. The decor is traditional Irish pub with hardwood floors. The decibel level at dinner time was probably pretty close to dangerous. It was loud. On more than one occasion, I had to ask my co-worker to repeat herself while we were trying to have a conversation. We thought we had made it in time for Happy Hour which excited C.W. Not for the drinks. We were on the clock, so we both got Coke’s. She saw appetizer specials. Turns out, we were late, but they were having a special on the Mac Attack. She asked if I wanted to split and I almost never say no to food, so we did. 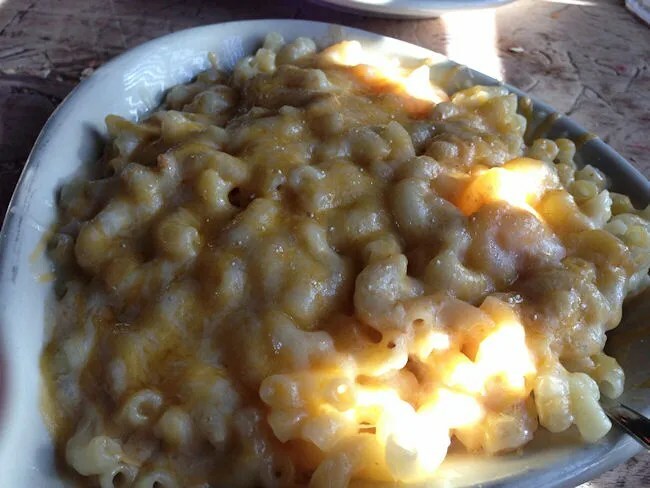 The Mac Attack is an appetizer portion of Mac ‘n Cheese. The macaroni noodles are covered with a muenster cheese sauce and Colby jack cheese. It’s prepared in an enamel dish that it is then served in. It was a pretty standard mac ‘n cheese dish. Nothing really stood out to me, but between the two of us, we finished off the dish fairly quickly. Just as we were finishing up the appetizer, our meals came out. O’Toole’s has a pretty good assortment on the burger menu which made it hard to pick just one. I finally settled on the Bridge St. Bomber. 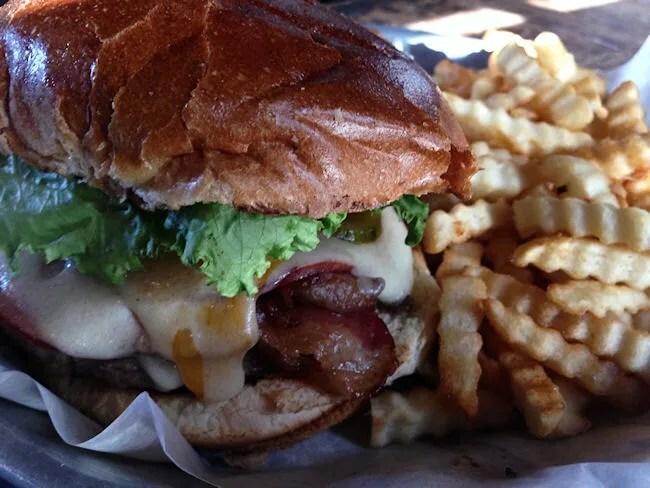 This delicious burger is topped with grilled ham, bacon, pickles, cheddar cheese, Swiss cheese, lettuce, and tomato on a brioche bun. All the pork products on this sandwich made a little salty, but duh, pork makes everything better. The juicy, perfectly cooked medium beef was barely able to hang on to everything on top of it. The sandwich comes with a generous portion of crinkle cut fries that were just that. Crinkle cut fries. C.W. ordered the Spinach Salad. She was worried about it not being big enough to be an entree, but her fears were quashed by the server who said it would be plenty. The bed of spinach is topped with dried Michigan cherries, toasted almonds, red onions, and bleu cheese. The whole salad is then tossed in a citrus vinaigrette. We split the checks and with part of the appetizer and a drink, my bill came out to right around $13. 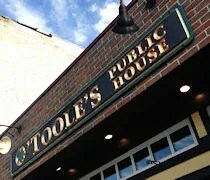 Neither one of us really knew what to expect when we walked in to O’Toole’s Public House. The online menu looked delicious, but neither of us had ever heard of anyone we know actually eating there. Turns out, those people we know are missing out on something.